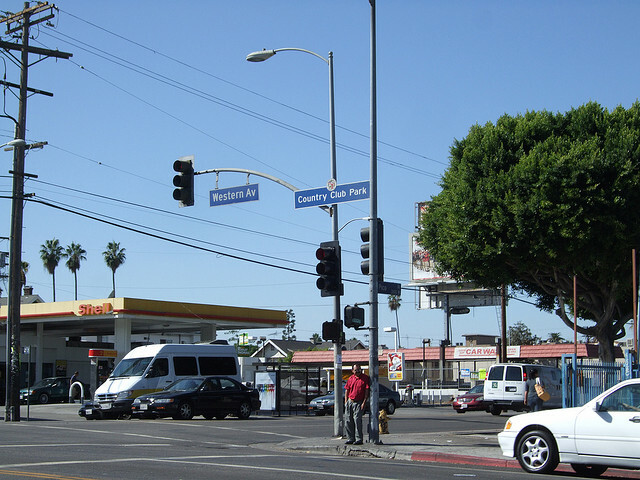 A typical streetscape in the Arlington Heights neighborhood of Los Angeles. Photo by Waltarrrrr. Planners Network, the organization of progressive planning, wrote about working-class cyclists in Los Angeles this week. Poorer sections of cities are notorious for having more dangerous intersections and this is true of Los Angeles. Beyond faster moving traffic in residential areas of immigrant commutes, unsafe sidewalks, higher rates of violence in low-income areas, higher rates of diet-related disease along race and socio-economic lines and fewer opportunities for physical activity, under-served populations also face persistent barriers to cycling. These barriers are especially pertinent given that immigrants are more likely to cycle than native born Americans. These factors, as well as the high concentration of immigrant populations in many cities, make cycling policy and outreach an important issue that has long-been ignored. Job access for many low-income residents is a function of their access to public transit; and low-income communities are often far from public transportation, not only increasing transportation costs for those that must have cars (or stranding illegal immigrants without a driver’s license), but helping keep poor areas poor. City of Lights also conducts outreach to target populations, runs community workshops on issues like bike maintenance, safety, and legal rights and works to garner and develop narratives of immigrant groups and their biking experiences. The group is also advocating at workshops and larger policy discussions. The focus is not unlike the South Africa-based project we profiled that uses photography to show a different face of bicycling culture. The significance of bicycling and mass transit is another reason to advocate for inclusive planning in cities to ensure affordable housing and work opportunities so all populations can enjoy the benefits of biking – it’s cheapness, opportunities for enjoyment and accessibility. Other projects, such as the ones supported by the Complete Streets Coalition, have the potential to improve cycling for all — including for those with the greatest need.